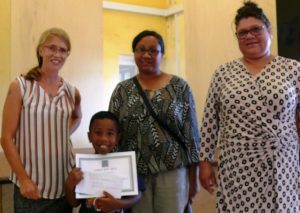 Three pupils – Ella-Mae Joshua, Year 6, Pilling Primary, Axel Francis, Year 3, Harford Primary, and Aisha John-Bagley, Year 4, St Paul’s Primary have been declared the winners for their schools in the first ever ‘Lunch Off’ competition. Healthier drinks and food are one focus area of the Health Promotion Strategic Framework 2018-19, which aims to reduce the incidence of chronic conditions such as type two diabetes and heart disease on St Helena. It is working with merchants and institutions on-Island to improve the availability of healthier items, and on the other side, encouraging and helping families and institutions understand how to adjust their usual meals, snacks and drinks to make a big difference for health. The ‘Lunch Off’ was one part of this, and focused on helping parents, schools, and children to ensure the children’s lunches are healthier in easy practical ways. The Lunch Off builds on some excellent work already being done in schools, such as ‘Fruity Fridays’, encouraging more water drinking, and expanding opportunities for physical activity. In the ‘Lunch Off’ competition which took place at each Primary School in February and March, class teachers held awareness and design sessions for children from Year 3 upwards to design their healthier lunch. The emphasis was on including popular items and things that are easier to get or buy and make. Parents of the Lunch-Off pupils received some information to help their children put their designs into practice. On Lunch Off day the children’s lunches were assessed by a panel of judges, including representatives from the Education Committee, Merchants, and Health Directorate. 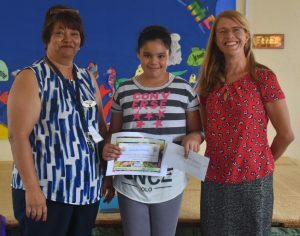 A winner for each school was chosen, that best demonstrated a healthy lunch that was also easy to make, included items that were easily available, and things that the children would enjoy eating. 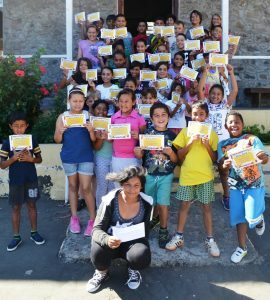 All participants received certificates for taking part. The new Governor of St Helena, Ascension Island and Tristan da Cunha, Dr Philip Rushbrook, accompanied by his wife Janis, will arrive on St Helena on Saturday, 11 May 2019, and will be officially sworn in the same day. Dr Rushbrook will be the first Governor to arrive by air at St Helena Airport. It has previously been announced that Dr Rushbrook would arrive on Saturday, 4 May, the same day that Governor Lisa departs the Island. However, Dr Rushbrook will now arrive a week later to enable the Administration to better manage the farewell arrangements for Governor Lisa and finalise arrangements for the inauguration of Dr Rushbrook. Further details on the inauguration of the new Governor will issue in due course. On Monday, 11 March 2019, Councillor Cruyff Buckley made a speech about policing on St Helena during the Adjournment Debate in the formal meeting of Legislative Council. The speech contained a large number of inaccurate statements that were conveyed as facts and which I would now like to take the opportunity to correct. Councillor Buckley also used the Adjournment Debate speech to express a number of personal viewpoints and judgements. One viewpoint in particular stands out. Councillor Buckley states: ‘In America, the policeman is a working class hero. In England, the policeman is a working class traitor. Who are the working class traitors on this little Island of St Helena?’ Councillor Buckley seems to be suggesting that St Helena Police Officers are traitors. The police officers he refers to are your family and friends who work hard to ensure St Helena is a safe place in which to live, work and invest. They are doing exactly what the Government of St Helena wants them to do – they are making the Island safe and yet Councillor Buckley seems to regard them as traitors. I strongly reject this assertion. Councillor Buckley also states in his speech ‘why use a gun when a knife will do?’ I find this reference particularly distasteful given that in the last few weeks a police officer suffered knife wounds – the police officer was responding to a situation of distress and did not think twice for his own life. 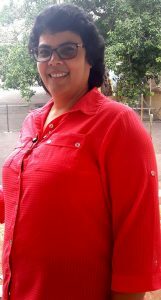 Acting Director of Education, St Helenian Wendy Benjamin, has been appointed to the substantive role of Director of Education. Wendy succeeds previous Director, Shirley Wahler, and her appointment is effective immediately. As the Director of Education, Wendy’s main responsibilities will be to continue to drive educational improvements across the directorate including through the St Helena Community College. Wendy’s experience in the education field on St Helena spans over 31 years. She joined the profession upon leaving school as a teacher trainee, qualified as a Locally Qualified Teacher and taught in the primary sector for 19 years. During this time Wendy held senior management roles including a Post of Responsibility for the Primary School’s English Curriculum and Deputy Head Teacher, she also acted in the capacity of Head Teacher for a short time. Wendy studied and achieved a Master’s Degree in Education with Distinction whilst carrying out a fulltime teaching role. This was done primarily via distance learning with a short six-month placement in Cheltenham, UK, to complete the taught elements of the course. Wendy was also able to gain valuable insight into the UK Education System as well as UK Primary School experience during this placement. In 2006, Wendy was promoted to Teacher Training Officer and became a member of the Education Senior Management Team. She worked in this capacity and then as Education Officer for Training and Special Educational Needs until April 2014 when she was promoted to Assistant Director Schools, a role which she has held until just recently. We are currently experiencing an outbreak of diarrhoea and vomiting on St Helena. This is also known as gastroenteritis. It is most commonly caused by a virus and is easily spread from person to person. It is normally able to be managed at home with fluids or rehydration salts (such as dioralyte). It should go away within two to three days. Your Doctor may suggest sending off a sample of your stool to a laboratory to check what’s causing your symptoms. Antibiotics may be prescribed if this shows you have a bacterial infection. One litre of clean drinking or boiled water and then cooled – five cupfuls (each cup about 200 mls). 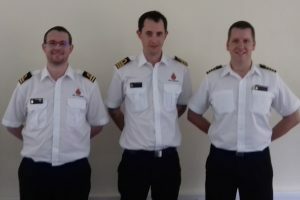 Three Officers from the UK Maritime Coastguard Agency (MCA) are currently carrying out a week’s training programme with Emergency Control Centre, Emergency Planning and Sea Rescue personnel. 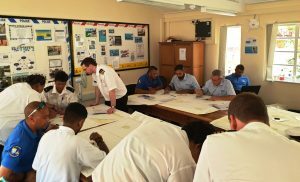 The training covers maritime radio communications, ship and boat safety procedures and maritime and aeronautical search and rescue procedures. The monthly meetings of the Environment and Natural Resources Committee and the Highways Authority took place on Thursday, 21 March 2019. The Roads Inspector gave an update on the Community and District Roads Grant. Recipients of funds under the Grant, who are still undertaking works to their roads, are reminded that all invoices must be submitted to the ENRD Administration Office at Essex House before the end of March 2019. It was noted that documentation is still required from Halcrow, the Project Management Unit (PMU) for the Haul Road, before this road can be adopted by SHG as part of the road network. The Head of Property informed the Committee that a lease was prepared for Creative St Helena for the use of the lower section of the Duke of Edinburgh playground. The lease will permit the area to be reused as a playground. He also confirmed that a draft lease between SHG and the St Helena National Trust (SHNT) on the future use of High Knoll Fort was being finalised. The Director reported that the Explosive Regulations, intended to make legislative provisions for the import, storage, transport and use of explosives, should be tabled to the Committee within the next few months. The Anaerobic Digester Project is progressing well and we now await the report from the Consultant. During the Consultant’s visit he held a workshop with potential users and interested parties to inform participants of what anaerobic digestion is, discuss its benefits and viability, and also look at various digester systems that are used to utilise the technology. Other projects of notable interest are the Composting Programme currently being undertaken by the SHNT at the Millennium Forest and the Marine Plastic Recycling Project funded through the Department for Environment, Food and Rural Affairs (DEFRA) in collaboration with St Helena’s Active Participation in Enterprise (SHAPE) and the SHNT. Amongst the issues discussed was a request for speed limit signs and road safety barriers across the Island. The Highways Authority would like to remind all drivers that the maximum speed to operate a vehicle on the Island’s roads is 30 miles per hour in the case of a motor car, a quadricycle, or a motorcycle; or 20 miles per hour for any other vehicle or as designated by road speed signage. Excess speeding of vehicles is not going unnoticed and all drivers are asked to adhere to the designated speed limits. All road users are reminded to use roads with due care and attention. Waste Management Services (WMS) trialled two new electric street cleaning machines in the Duke of Edinburgh (DOE) Playground, Jamestown, on Monday, 25 March 2019. The new machines are powered by a lithium battery, and as such, are much quieter than the leaf blower/vacuum machines WMS would normally use. The new machines operate at just one third of the decibels of the petrol leaf blowers. 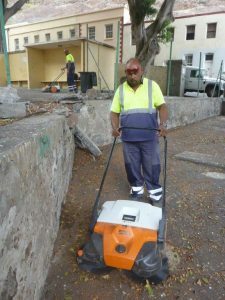 “WMS had received a few noise complaints when using the leaf blowers from 6.30am to 8am for the cleaning of pavements and public areas. 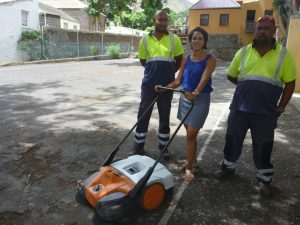 “In line with our Mission Statement of ‘working in partnership with customers for a cleaner and greener St Helena’, we researched alternative equipment, not only to mitigate the noise issue, but also to deliver a more efficient service that is also environmentally aware. On Monday, two WMS staff cleaned both the upper and lower sections of the DOE Playground within 90 minutes, which is the running time for the lithium battery fitted to each machine. To achieve the same results with the petrol leaf blowers it would take more staff and more time whilst also creating more noise. During this week the machines will be further trialled for cleaning the pavements from The Market to the Grand Parade before being used as part of normal operations. 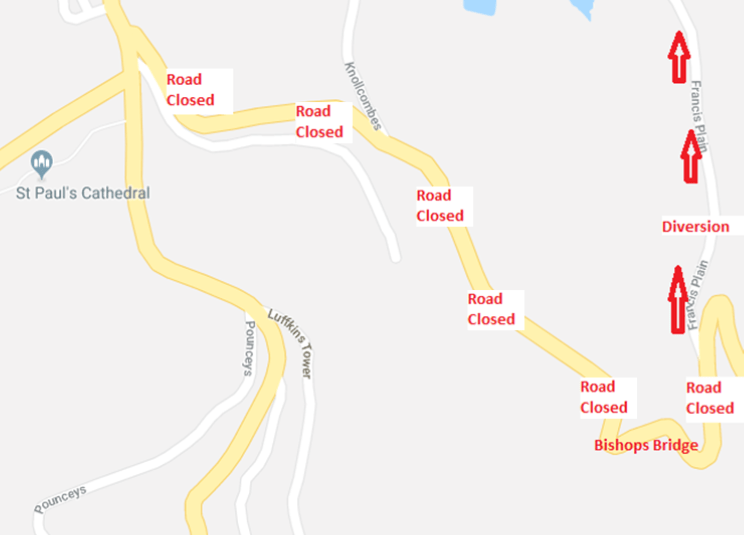 The Roads Section of ENRD would like to inform the public that the Highways Authority has given approval for the road from White Gate to Water Course Road to be closed from 9am to 3pm on Tuesday, 2 April, and Tuesday, 9 April 2019. This closure is to allow the Roads Section to begin conducting trial mixes of alternative patching/surfacing methods for the Island’s road network. The road will be closed to all traffic including Emergency Services’ vehicles. The diversion route will be via Francis Plain Road towards Scott’s Mill and Red Hill Road and vice versa (see below map). The Roads Section would like to apologise for any inconvenience caused and thank the public in advance for their continued understanding and cooperation. St Helena Police are currently investigating the theft of the convex traffic mirror from Sunnyside Junction in St Paul’s. The theft took place sometime between 1.30pm on Sunday, 17 March, and 7.45am on Monday, 18 March 2019. The public is reminded that convex traffic mirrors are located at various traffic blind spots around the Island. The removal and/or theft of these mirrors can compromise the safety of road users. There is also a significant cost attached to replacing them. Police are appealing for any information that any member of the public may be able to supply in relation to this theft. If anyone has any information which may assist with this investigation, regardless of how minor it may seem, please speak to a Police Officer of your choice, contact Coleman House Police Headquarters on tel: 22626, or email: cid@sainthelena.gov.sh.